I wanted to write something on the blog, since I woke up pretty early today (which is an achievement, considering it’s a Sunday morning). And, as usual, if I don’t know what to write but my fingers are aching to, I’d stare around me for some ‘inspiration’ (for the lack of other related words). …And I will fight, until the day I see you again. Ever since I fell in love with this anime (Sword Art Online), I’ve always wanted to get something that represents it in my room. A poster, a replica of the sword, or even Kirito’s midnight coat. I mean, I really love this anime. So when I moved in to my new studio last month, I ordered this poster on Amazon (my trusted online-shopping website, other than eBay). There were a few other options, but I found this one to be the nicest (in my opinion). Shipping took a while since the seller is in China, but it still arrived earlier than I expected (it was expected to arrive between Sept 3-18). Other than the small dent in the rolled-up package (evident on the bottom part of the poster), it looked just great. Quality-wise was great too, it was not like normal poster paper (I have Dragon Ball & Death Note posters in my room too, bought from a poster sale on campus), but it felt more like fabric. I’m bad at describing things, so let’s just leave it at that. Okay, so what’s the reason for this sudden and random picture of a Sword Art Online poster that’s hanging on the wall of my studio bedroom? “No matter what, my heart will be forever yours. In the anime, it was more to Kirito fighting and putting his life on the line to save Asuna, the love of his life. But, when you look at it, we are all just like Kirito, fighting for something or someone in our life. For a father, he may be ‘fighting’ and working to his best abilities to provide food and shelter for his wife and children. For a mother, she may be ‘fighting’ and risking her life to give birth to a child. For a teacher, (s)he may be ‘fighting’ and sacrificing his/her life to educate the future generations. For a student, (s)he may be ‘fighting’ and surviving in a strange land to gain knowledge and experience. Whatever it is, or whoever it is, everyone out their is fighting their own battles, for their own personal reasons. And now, let’s think of ourselves. Why are you where you are in the first place? What’s your goals in life? Think about it… Are we here merely because we’re supposed to, or because we believe in something and are fighting for it? I used to work hard and try to achieve successes because it was expected of me. People expect me to succeed, to go further in life. People expect me to be successful. And you know what? Trying to live up to people’s expectations is hard. No, wait, scratch that, it’s not hard. It’s impossible. ‘Cause if you only live to fulfill people’s expectations, you’ll never accomplish that. It’s like you’re living, but you’re dead inside. You have no purpose but to fulfill what others want from you. It’s like you have no goal in life, no self-motivation. So take a moment to think about it, and find it. Find your goals in life, the reason(s) for your existence. It doesn’t have to be of super importance to the world, like ending climate change or creating world peace. As long as it’s important in your life, and can give you the push to work harder and aim for the best in your life, that’s perfect enough for you. Assalamualaikum. Hi there. i’m here because i’m still looking and searching and thinking what i’m going to be in the future. i haven’t decide who am i suppose to be in the future. it is a bit problem for me because when i asked my friend about their future, they answer proudly. for me i still blur. so do you have any tips on how i can find my goals? I suggest you to take some time off (perhaps at night, or early in the morning, or any time of the day that you can sit quietly for a few minutes on your own). Think about your life. Think about what makes you happy. Think about what you’re passionate about, what you want in life. Think about what you’re good at, what you’re bad at, what you’re exceptionally good and bad at. Think about the times when you might feel like giving up, but ended up going the whole way. What made you decide to do what you want to do? List down everything that comes to mind. List down what your interests are, what your hobbies are. Betul. Kita hidup bukan nak impress org,, btw cantik bilik nazu! Have you tried Angel Beats ? Btw that is a great poster and post. do u watch one punch man? 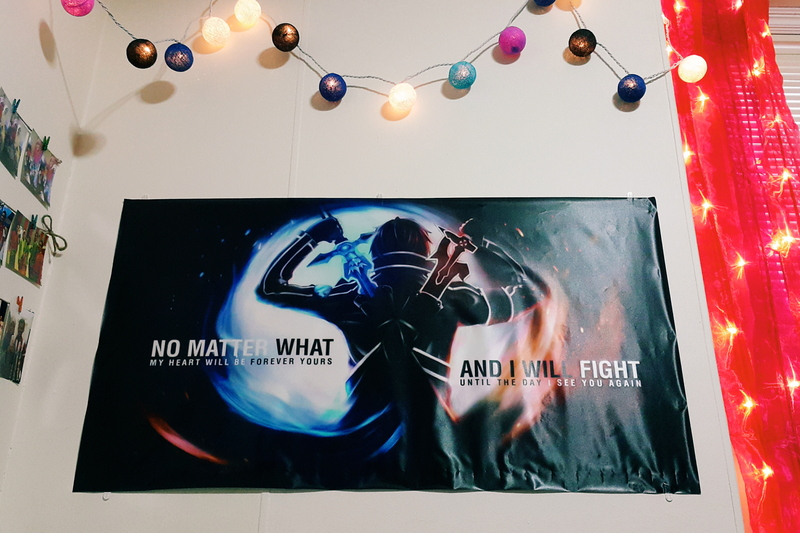 Hey do you know the link where I can find that poster, that image is special tome and I would love to know where i could get one for my room. Hello! I bought it from Amazon (https://www.amazon.com/Sword-Art-Online-poster-inch/dp/B00PBRUGT2/ref=sr_1_7?ie=UTF8&qid=1518658518&sr=8-7&keywords=sword+art+online+poster) It’s this one! Next post	"Don't succumb to society's expectations of you."